This collection celebrates the California woman's spirit and style. This woman is a beguiling mix of glamour and grunge. She can be a tomboy or ultra-feminine depending on her mood. Inspired by this dichotomy, we built on our most iconic silhouettes by adding statement sheepskin, oversized patches, and eye-catching details. Bold, whimsical, and uniquely UGG, this collection marks a new expression of the brand – one that is true to our roots and novel in its approach. a very West Coast attitude. Playful patches meet bleached denim to evoke a very West Coast attitude. 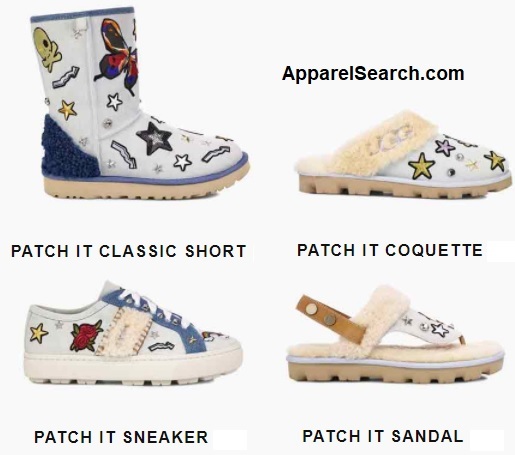 Shop for the Patch It Crazy shoe collection at the UGG website.